Product #60573 | SKU 5-4012 | 0.0 (no ratings yet) Thanks for your rating! 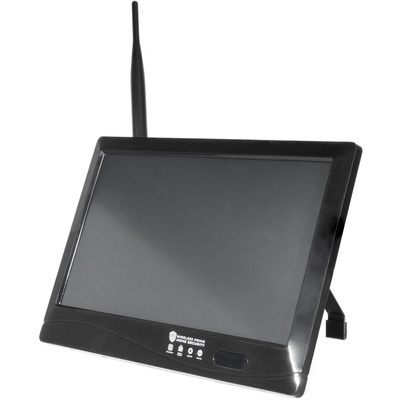 The Cinegears Wireless Prime UHD Touchscreen Tablet DVR (10"/25.4cm) is a 2.4 GHz wireless touchscreen monitor with an integrated video recorder and speaker. Featuring a 1080p 25 fps display, this tablet supports up to four 5-401 Wireless Prime security cameras with 24/7 overwrite recording. It can store AVI format files up to 128GB on an SD card or up to 3TB on an external drive via the USB 2.0 port. Smartphone applications provide access to remotely view camera feeds with an iPhone or Android device.